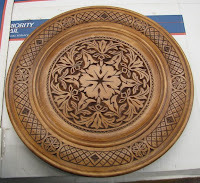 I took a chip carving class this weekend at Olde Mill Cabinet Shoppe with master carver, Wayne Barton, who studied all disciplines of carving in Switzerland, has won both national and international awards, is the author of two chip carving books, has appeared on both The American Woodshop and The Woodwright's Shop, and is a very entertaining and affable man. Wayne not only taught us several techniques and patterns, he discussed wood choice, finishing, tools, sharpening, design considera tions, and the characteristics that indicate a wel l executed chip carving. Wood: Basswood, butternut and white pine. 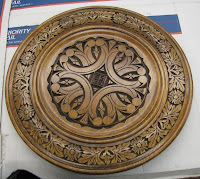 Finishes: Spray-on, satin polyurethane for a natural finish, and General or Bartley gel stains for a darker finish. Tools: Wayne developed carving knives that are made from high carbon steel, which hold an edge longer than kniv es made from high speed steel. They take longer to sharpen, but work much better. He sells his knives on his website. Sharpening: Wayne recommends ceramic stones, available on his website. We used them in class and they are small enough to fit in your hand, easy to clean, and remain forever flat. Wayne's pearl of wisdom: "The world has been made with a sharp edge." 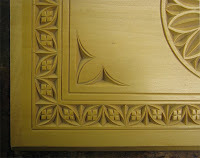 Design: Wayne is influenced by gothic architecture and European cathedrals. He designs his pieces with attention to visual rhythm, negative & positive movement, spacing, balance, contrast in size, var iation in line, and focal points. Diagonal lines represent movement & energy. They are lines in transition, as opposed to horizontal and vertical lines, which are stagnant. 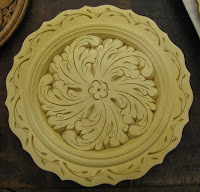 Good chip carving: Has single facets and sharp ridges, and does not have little remnants stuck in corners. It is clean and crisp. We spent sev eral hours sharpening our knives and working on techniques. 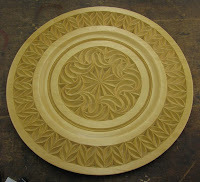 Chip carving is more fun and relaxing than I had anticipated and the design possibilities are endless. 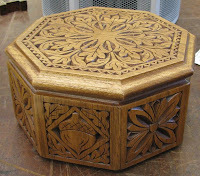 According to Wayne, it's the oldest form of carving, and has found its way into all countries and cultures. The last two photos are my practice boards along with the two knives we used in class. The knife on the right is the workhorse and the knife above the board is used for decorative st ab cuts— the only tools you need if you want to include chip carving in your projects. During class, Wayne played CDs of various types of music including classical and opera performed by people whose names I can't pronounce, and threatened to play polkas if we got out of line. What an incentive to be studious!